If your New Year's resolution is to get into shape, perhaps lose a little weight, you may find inspiration in "Lily" the skunk. Lily lives at the Houston Zoo. She's one of their handling animals and participates in Keeper Talks and some shows at the Butterfly Stage. One of her keepers noticed that Lily had put on a bit of weight, especially around the middle. So she decided Lily needed a change in her diet and more exercise. 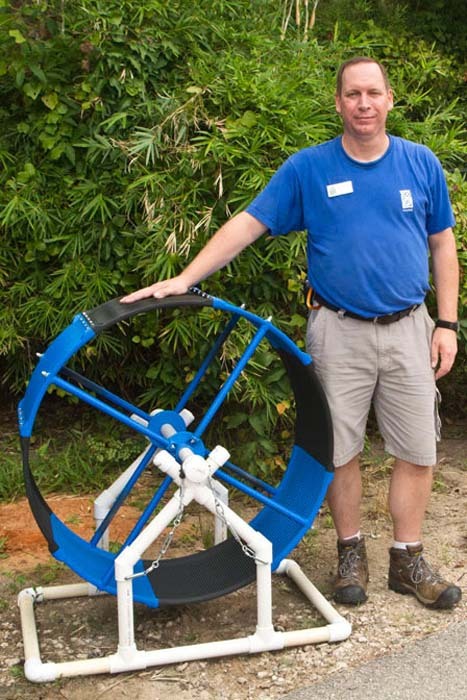 Zoo volunteer, Matthew Griffiths came up with an interesting idea: a giant exercise wheel...like a bigger version of something a hamster would use. Skunks are naturally curious animals and Lily took to her new wheel almost right away. She soon reached a healthy weight by walking and even occasionally jogging on her wheel. And she's kept the weight off for several months now. Now, Matthew is pondering what other animals at the zoo might like their own exercise wheel.